One month on from rescuing our last Olive Ridley Turtle from ghost nets, we were lucky to have Martin Stelfox, the founder of the Olive Ridley Project (ORP) come and visit our resort! If you're a regular reader of our blog, you will know that the Olive Ridley Project is an NGO focusing on removing and collecting data on abandoned or discarded fishing nets from the Indian Ocean. These nets often cause marine animals such as turtles, cetaceans and sharks to become entangled. In particular, we see large numbers of Olive Ridley Turtles entangled, and so this species became the face of the project. Our days with Martin were packed full of educational initiatives and outreach programs for guests, staff, and even the local school children! 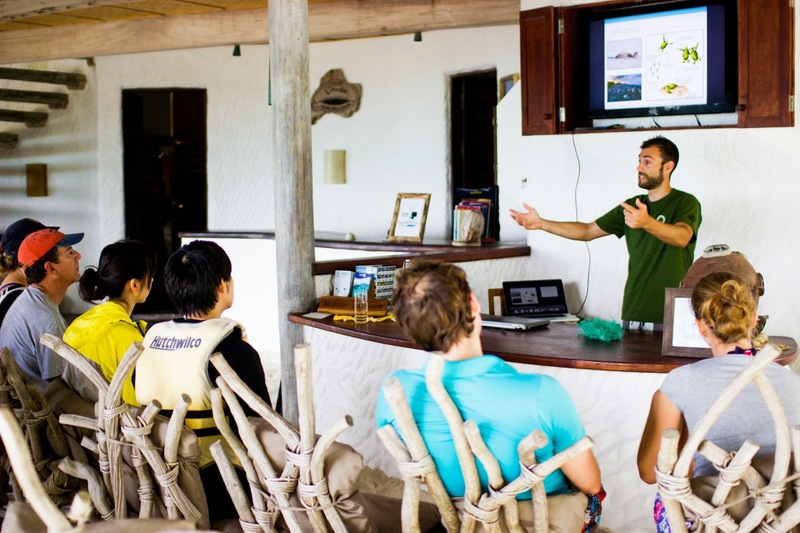 The first morning began with an exciting guest experience, where our guests were treated to an interesting talk about turtle biology and the threats facing our turtle populations, with a particular focus on the star of the show- the ghost net! With our heads full of turtle related knowledge, we headed onto the boat for our snorkeling trip. Floating along the stunning reef of Thulagiri, we spotted hundreds of colourful fish and many different coral species, but what we really wanted to see - the turtles - still evaded us. However, right at the end of the snorkel, we got a surprise as one eagle eyed guest spotted a small Hawksbill turtle a few meters down, feeding on sponges in the reef! As we floated from above to watch, the juvenile turtle slowly drifted up towards us and swam smoothly along the reef, allowing our guests to take some excellent photographs! We were even able to take ID photos of the turtles face, and hope to find out some information about that particular individual! Following our successful, turtle filled morning, we prepared for the next event of the day- a trip to the local island school on Himmafushi. Just 10 minutes ride on a local dhoni brought us to the beautiful island of Himmafushi where the grade 9 students were waiting for us to teach them all about the importance of the local turtle populations, the laws surrounding poaching and keeping turtles as pets, as well as being taught what to do in the case of finding entangled marine life. The school was keen to see us return in the future for more marine related lessons and presentations! Education at schools is key to preventing the problem in the future! Martin and myself joined the GM's cocktail party that evening and spoke to many guests regarding the issues of ghost nets and the plight of marine creatures entangled within them, and later we moved into the host area to deliver a presentation for our staff where representatives from all departments came to listen to what Martin had to say. Particularly relevant was the training he provided for ghost net removal and marine life rescues, with specific focus on the best way to untangle a sea turtle featuring myself, Debs, as the entangled turtle! 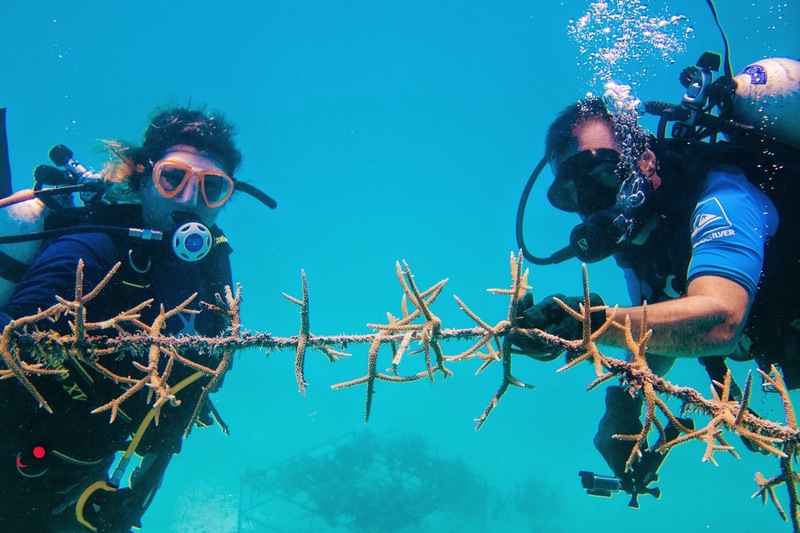 Training continued over the next day as well for our staff, and once Martin was all presented out, we headed out to show him our Coral Lines Project nursery, where we planted a line together with Martin in the name of the Olive Ridley Project! All in all, it was an extremely successful and eventful few days! 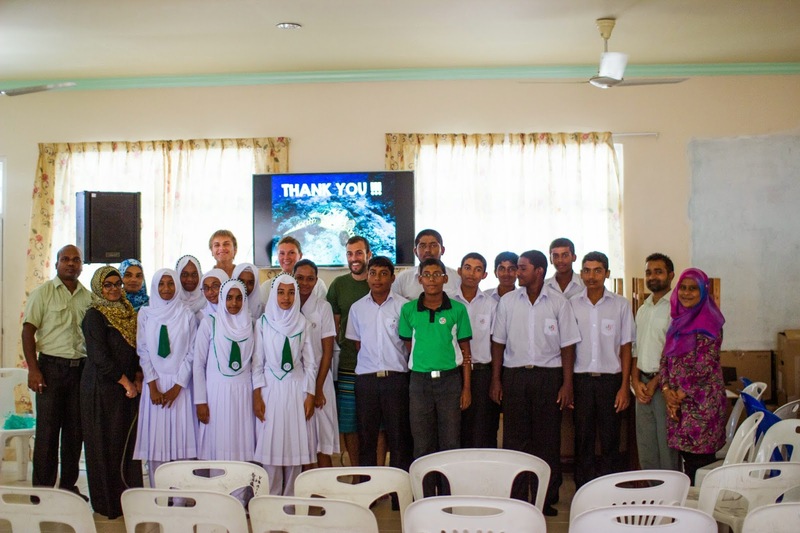 Our thanks go to Martin Stelfox and the Olive Ridley Project for their time, and we hope to continue to collaborate with them and send them data for many years to come! Together, we can make a difference in reducing the number of ghost nets in our oceans. Gili Lankanfushi Maldives. Underwater World. Created by Vaidotas Kirsys. Powered by Blogger.